- Kenenisa Bekele on the sudden death of his fiancée Alem Techale nearly five years ago while the two were out running together. Bekele races today against top cross country competition in Edinburgh. This lengthy Times London piece asks the 24-time world or Olympic champion about his career goals, the respect he gets (or doesn't get), and his plans for the marathon. Guys who proposed: did you ask her father for approval? Early Predictions on Sportsperson of the Year for coming decade? Former world record-tying (9.76) Justin Gatlin's biggest battle will be similar to that of fellow busted drug cheat Dwain Chambers - getting accepted into the big races. A very good read. Donohue is one of the few top distance runners in the US who is based on the East Coast. In America, doesn't it seem like virtually every town has their own track purchased by the taxpayer? Global sprint factory Jamaica sent Asafa Powell and others to help get funding to redo two track surfaces. Despite the loss of Galen Rupp, Oregon have Ashton Eaton, Andrew Wheating and Matt Centrowitz to anchor their ship in 2010. Smyth, one of the new kids on the block in American road racing, was 2nd in Manchester and 1st in New York and will debut in the half in less than 2 weeks. Good news for race organizers. Bad news for runners who didn't plan practically half a year in advance. The 2 Mammoth stars look to get back on a positive roll after Hall's stagnant and Kastor's un-Deena-like running in 2009. Slot reports from Iten and describes the running factory that is churning out distance-running stars and hope, in the form of hundreds-strong packs of runners. The Emperor has started twice in Dubai and twice produced all-time top 8 marathon times. He'll have good competition and hopefully good weather for another crack at a record at the unthinkable age of 37. Pictured left, Atsede Bayisa ran 2:28 to win by over 5 minutes in China. Her best is 2:24 from a win in Paris in 2009 (she ran 4 intl. marathons in 2009). This article also gives quotes from the men's winner Feyisa Lilesa, who apparently ran almost the entire race with an injury en route to 2:08. 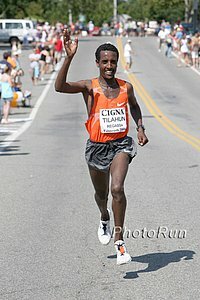 Kenyan Runs First Half Of Tiberias Marathon In 61:42 (Israeli HM All Comers Record) Before Fading To 2:18! American decathlete Dan O'Brien is going to India to promote the sport to kids. The crazy Canadian has run 6 of his planned 250 marathons in 2010 in an effort to raise money for a charity that supports sports for kids. The latest temperature was -31° C.
2-time world champ Jana Rawlinson was unhappy with her body and got breast implants. Now she has publicly announced she will have them removed. We'll get to see Kenenisa Bekele run half-trained against the world's best XC runners in great shape. 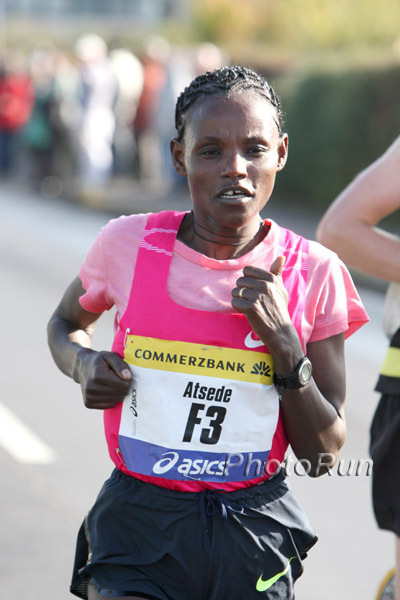 Tirunesh Dibaba, on the other hand, is extremely fit and should crush the field (well, Vivian Cheruiyot may contend). Bekele is downplaying his return, saying he's coming off a long holiday from running. '09 World Champ Gebre Gebremariam has been hot on the European cross circuit. If Bekele beats him his first time out, we can look forward to another year of dominance from the 27-year-old Bekele, whose greatest opponent seems to be his own boredom with being the greatest. Dibaba vs. Cheruiyot is an interesting rivalry. Obviously Dibaba should be the big favorite and any runner from GBR can just forget about winning.